It's been a long time between posts. The main reason is that the past two months have been, by some measures, the best and busiest of our lives. There was the annual conference of the national organization I chair that was, for the first time ever, held in Montreal. As soon as that ended we celebrated the marriage of our eldest son. Sonja and Roland came to visit, then Susan and I went on an amazing trip that took us to Edmonton, Jasper Park, Vancouver, and Maui. Phew. Along the way, I worked on this post, mostly during our flights. I hope you will find it was worth the long wait. I'm getting slightly more experienced with touring. That means I still have a lot to learn. This article is about the lessons I learned in the 2015 season. If what you were hoping for was a more comprehensive lesson (based on my limited experience, of course) click here for the 2013 Blogger to Blogger Tour epilogue. Then you can come back here and get the 2015 update. If you are leaning towards overseas moto travel, click here to check out the 2014 Blogger to Blogger Tour epilogue as well. "Geez, it's like a freaking college course" you're thinking. I guess it might look like that. At least I don't take attendance, and bonus... you can't flunk!!! Lesson one: let's start with the most important lesson I hope I managed to learn: watch your instruments. I pushed my Vespa too hard on the Interstate, in the mountains, wide-open-throttle, on a hot summer day, and it blew its stack! Luckily it just belched ~250-400 ml of coolant out of the reservoir cap, so no engine meltdown happened. I was lucky, able to limp along until I could replenish the antifreeze. The anxiety and inconvenience it caused could easily have been avoided by keeping a more critical eye on the instrument panel. My mechanic François at Montreal Vespa was smirking in a friendly way as I related the incident to him. "The coolant blew out of the reservoir, right?" Yup, lesson learned. Lesson two: Carry a litre of coolant just in case you forget lesson one. A water bottle like the type sold for sports hydration should do nicely, or a fuel bottle, and there are many ways to carry it. For the Vespa, my choice would be mounting it under the rear rack using stainless steel belt clamps with large plastic thumb screws which you can find at the hardware store in the plumbing section, or at a store that caters to camping and recreational vehicles, like Canadian Tire, for instance. Lesson three: If you're going to be camping, carry the best bug repellent money can buy. A can of insecticide should also be on the list. We camped in the heart of the Adirondack mountains. Apparently we were the only unprotected juicy mammals within a ten mile radius and had the mosquitoes, deer flies, horse flies, and black flies all to ourselves. Not much fun. The armoured gear spared us from needing a transfusion. 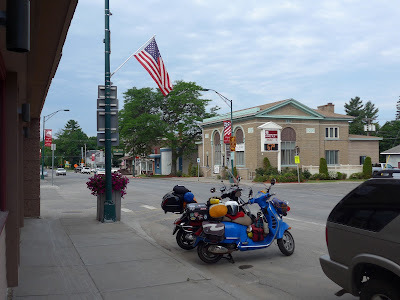 Lesson four: If the person you're travelling with is a talented artist and professional illustrator, and she is completing a fourteen month solo tour of the contiguous forty-eight States, make the most it and chat with her at every opportunity. Topic one: What happens when you reach the 48th State when you get to Lubec, Maine, the fourth 'corner' of America? Is that really your final destination? Of course Stephanie's answer was an easy "no". Fourteen months is a long time, so Stephanie had ample opportunity to ponder the geographic end of the current road trip. That, and there was also a long time before the trip even became a reality to think it through. There had to be a smouldering fire in her gut to propel her on such an epic journey. I'll get to that in a moment. Stephanie Yue is living on a higher plain than me, and most people in my circles. She's a talented commercial artist who's in demand. She's also a serious martial artist with the scars to match that distinction. Oh... and she climbs. I mean *climbs*. Like high up on rock faces. She has a quiet determination and a strong character. This is who she is. Those are the qualities that make a solo road trip like her's possible. In keeping with her character, there is no existential angst associated with the end of the road. Because it isn't, of course. The end of the road, that is. There are plans for life after Lubec. Topic two: After fourteen months on the road, what are your thoughts on the transition to life in one place? This question betrayed my personal bias. I think that none of us, or at any rate very few of us, truly lives in only one place. That said, I have sometimes thought of my life like a bright spot of light visible from a point in space where the whole planet is in the field of view. I see my entire life so far in a span of 60 minutes or so. As I travel here and there, my tiny dot of light seems to barely vibrate, minute after minute, at a single point in the new world, a short way upstream from where the Gulf of St-Lawrence ends, and the river begins. Then it hops to England for four seconds, blips to France for a fraction of a second, and then goes back to vibrating in the place it first glowed. Eventually it hops around the United States and Canada. At about the 26 minute mark, give or take, it hops to Europe. Later still, it pops between its rooted little northeast spot and the west coast, and the southeast coast, and Europe again a few more times. It's not a very interesting point of light. I understand life in one place. Stephanie's life-light is much more interesting. It springs to life on the east coast of Asia, flits to North America and flies all over the place. At the 30 minute mark it zigs and zags all over the U.S. Stephanie is used to moving. My question to her forces her to think in unfamiliar terms. "Life in one place? Let's see... might not happen...", is the short answer, delivered with unflinching confidence. Topic three: What percentage of nights during your mega tour were spent camping? Stephanie considers herself to be an urban woman. Camping has its moments, particularly in California, but it's a necessity, a means to an end. Like the Vespa. It does the job. Not that she isn't attached to that machine, because she is. Like a cowboy and his horse. I wouldn't be surprised if she talks to it, when it's just Stephanie and the Vespa. Walking on Mount Royal on my way home from law school, in late fall, when I thought I had the mountain to myself, I was cutting along a trail leading to the gravel road they call the Snake. As I neared the road, there was a burly mounted policeman walking along, the bridle trailing loosely in his right hand, the horse walking beside, its head bobbing softly near the cop's shoulder, listening sympathetically, while the policeman was deep in a one-sided conversation with the horse. Not quite like that, but I bet Stephanie does talk to her bike. That said, it's a bike without a name. Stephanie is not a bike-namer. Neither am I. Right, back on track... so the answer... maybe ten, or fifteen, or twenty percent, is her guesstimate. I'm not a camper either, by any means. I feel pretty much the same way as Stephanie. I like how, as different as we are, our Vespas are so similar. Parked next to each other, they are birds of a feather. No-name Italian works of art that fairly scream of adventure on the road. Now that's truly cool. Though I feel like a poser, really. Stephanie is the real deal. Topic four: Tell me about the San Francisco tuneup and Piaggio's contribution. I remembered that the San Francisco Vespa dealer undertook a massive tune-up. Like about two grand worth or more if memory serves, largely funded by the manufacturer Piaggio, to their credit. Very professional, in some ways. Yet curious in others. The dealership got Stephanie thinking that her bike might be nearing the end of its useful life. When me met she had forty thousand or so miles on the clock. That's a lot, but nowhere even approaching half a well-maintained Vespa's life expectancy. My mechanic François confirmed this later on when I took my own bike in for service. He was stumped as to why a major dealer would say that. There's that, and then there's the mystery of Piaggio's overall marketing chops. I've mentioned this before. 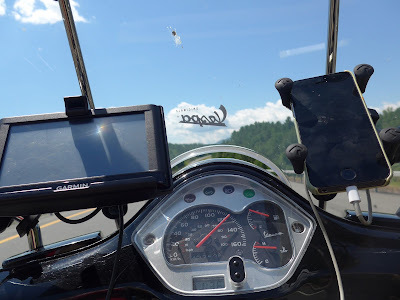 People who take Vespas to new heights, who inspire through their accomplishments, like Steve Williams, Stephanie Yue, Michael Strauss, Michael Beattie, Ken Wilson, Jess Devine, Bill Leuthold, and others, present huge marketing opportunities, it seems to me. Their bikes, and their stories, belong in the Pontedera Vespa museum. They should be recognized as brand ambassadors to be sought out, recognized, and enlisted. What could the cost be, in terms of Piaggio's worldwide income statement? More or less nominal. Instead of hiring models with pretty faces to be the exclusive face of the brand, some aspect of the marketing budget should go to real-life brand ambassadors. There, I've said it again. Another voice, not a major voice, speaking in the wilderness. There's a tiny chance that my rant will reach the ears of Piaggio's brass. But it's little more than a shot in the dark, at best. Topic six: Drawing is what you do for a living. What's it like to do the daily drawing? It doesn't matter what you do, or how much you love it. Imposing a daily dose of your favorite thing on yourself can take a toll. Stephanie confided, not surprisingly, that she invested a lot of energy in the daily drawings, and, late in her tour, she had fallen behind on daily drawings and blog posts. But that's incidental and trivial when you look at her blog from its inception back in the spring of last year. The fact is that the last time I checked, she was catching up at a good rate. 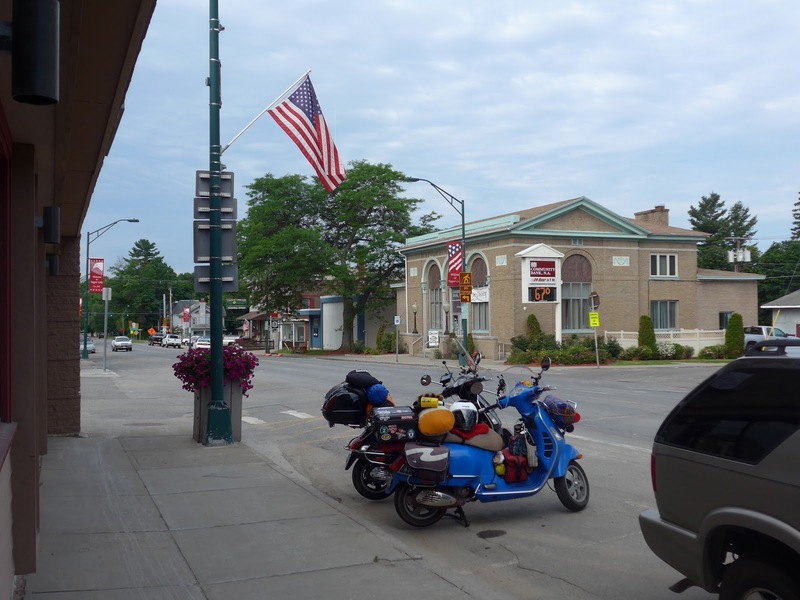 When we were having breakfast in Tupper Lake, at the Swiss Kitchen, Stephanie got an e-mail that caused a momentary cloud to drift across her face. "Bad news?" I asked, concerned, with absolutely no intention of prying. She said no, in fact it should be good news. A fresh manuscript was being offered to her for illustration. The cloud lurking around the silver lining was the timeline for the project. She would have to hunker down in one spot quite soon, likely in Providence (how poetically fitting, freelance assignments are providential), if she was to get the job done. Not a prospect Stephanie was relishing at that moment. That launched her into sharing some of the deeper motivations for the trip. Believe it or not, Stephanie doesn't think of herself as a gregarious person. After reading her posts for over a year, that came as a surprise. Her natural tendency to be quiet, and the long hours devoted to illustrations on a project schedule, day after day, in her apartment, left her craving the outdoors, open spaces, open roads, and interaction with people. She had to break free. She needed a radical change of pace and scene. When Stephanie finds herself pondering the future, this dichotomy will be somewhere near the core of her thoughts, I think. Topic seven: We discussed the tyranny of stuff, the gifts we exchanged, and hobbies on the road. Susan I are at a stage of life where we are downsizing. It's a good thing because lately I have been getting the feeling that all the stuff we've collected over the years owns us, rather than the other way around. Stephanie had to downsize to take on her continental journey. In her case, she basically restricted her daily circumstances to stuff she is able to carry on her Vespa. Now that's truly radical. Yet I don't think that her pared down life has gotten in the way. Quite the reverse really. I think she would say that her daily life during the tour was far richer than if she had spent all that time working out of a large well-furnished home with all the amenities. 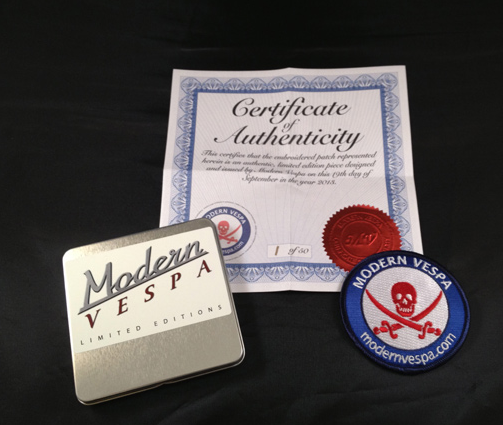 With that in mind I offered Stephanie a few small gifts that would take up as little space as possible so that she would not be burdened with them: a limited edition ModernVespa.com patch (the pirate patch, because to me, of all my patches, it came closest to evoking her bravado and amazing accomplishment), and a transparent waterproof map sleeve, useful for making sure that any paper she might carry wouldn't get ruined by water that might leak into her belongings during her travels. She also had a gift for me. Which brings me to the issue of hobbies on the road. Stephanie knits. She knitted me a cup or bottle holder designed to hang from the Vespa's bag hook. It takes up no room and lives happily in my Vespa's glove box. She had mentioned these knitted cup holders on her blog and I had posted a comment. I was very touched that she had remembered. Topic eight: Parents and home life. I asked Stephanie where home was. I was a little surprised by the answer. Reading her blog, I knew her sister lived in Madison, Wisconsin, and Stephanie related family stories from California and Texas, so I just assumed that her parents lived somewhere in the U.S. which is where home had to be. Wrong, it's Hong Kong. That goes a long way to explaining why Ms. Yue is so well traveled and doesn't shy away from an adventure. Topic nine: Bikes, and the unexpected wonders of Vespas as touring vehicles. 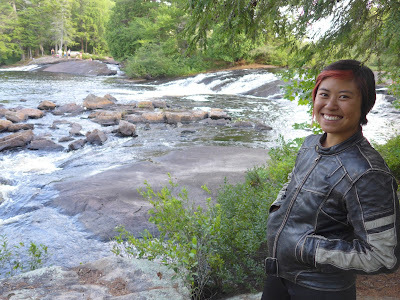 Stephanie has owned a motorcycle, and has driven a variety of them. She shares my view that Vespas are amazing touring bikes. She has even expanded her repertoire from pavement to the pleasures of gravel and loose soil. A good friend with even more experience with motorcycles confided to me recently in a hushed tone, that she preferred to tour on a Vespa than... shocker alert... the BMW GS!! Yes I know, strange... but true! It's a tale of exceptional ergonomics, storage options galore, all wrapped up in gorgeous sheet metal. Topic ten: Bourbon. Actually, bourbon, whiskey, scotch, rye and similar pleasures. Please forgive me, but we got to this topic very late in the day. Stephanie offered me some whiskey. She poured some into an empty plastic water bottle and rolled it to me between our tents. I am not by any means a drinker. I only recently made my way through a bottle my very first bottle of single malt Scotch that I received as a thank you in October of last year. Sip by sip, week by week, I developed an appreciation for that bottle of scotch. I think I'll buy another. Stephanie patiently answered my questions, explaining the difference between the various malt liquors. It was late, and I remember little. Thanks Stephanie, I thoroughly enjoyed the nightcap and the conversation. A delightful way to end a delightful day. As you can see, I avoided all the topics that most women would have covered in a heartbeat (sorry ladies). Lesson five: Fasten loads better. I lost a one gallon jug of coolant. Traveling along a gravel backcountry road I felt the load on the pillion saddle shifting. I thought it was just settling a little. then there was a slipping feeling and the antifreeze container hit the dirt. I circled back to retrieve it. A sharp rock had made a small puncture in one of the bottom corners, and the contents were leaking. I pondered the situation for a minute or so, but there was nothing for it. The situation might have been avoided by threading a ROK strap through the jug's handle for instance, or using some paracord to secure the container to the small rack on the topcase, or making a paracord security tether, or... It wasn't the means to do the job I was lacking, it was attention to detail. I was not proud of myself. Lesson six: Keeping a travel log. I got so carried away with the immediacy of my trip that I neglected to record the vital statistics, like the time and mileage at departure; the time and mileage at way points; the fuel consumed; the names of places where we stopped; and so on. With the tools at our disposal these days, there are many ways to make up for the absence of a travel log or diary, but nothing substitutes for the precision that scribbling or typing a few timely notes allows. There is no excuse for not just doing it. Lesson 7: There is never enough time to go slow, it seems. It's the economy of road trips. Even though it's a leisure trip, there are still places you need to be at a given time. And yet I could have managed my time better and enjoyed the trip more. For instance, less speed on the Interstate might have been more than compensated by less time dealing the coolant issues. Instead of waiting for Stephanie to arrive for the better part of an hour and a half or two hours sitting in a parking lot, chasing the shade and watching traffic, I could have stopped at a few of the many scenic viewpoints along the way to admire the scenery, shoot some pictures, and make some notes in a travel diary. I would still have gotten to the destination with time to spare to greet Stephanie. I think that's all I've got. My final thoughts are with you, the readers. Many of you are far more experienced than me. I'm thinking of Bob, Karen, Richard, Ken, Dom, Sonja, Dave, Bill, Peter, and others. I have little to offer you other than a heartfelt thank you for inspiring me to get out and ride. 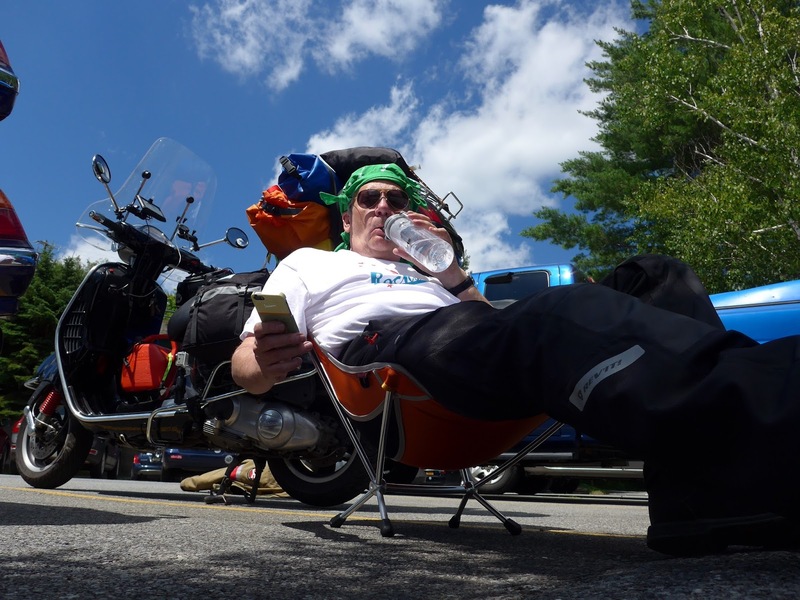 To the readers who haven't yet embraced the joys riding and touring on two wheels, if I can do it, anyone can, and so can you. There is a chance that you will be inspired to venture out on your own two-wheeled adventure. Thanks for reading, now go and chase your dreams and desires. What a great summer! Lots of adventures, fascinating meet ups and a little travel thrown in. David, good stuff! Now we must find time to tour again - either come to FL or next summer in the Adirondacks my friend. Dave, safe this post and update after two years of real retirement. Be interesting to see your thoughts. Especially that anti-freeze thing. You know water will do the same job in a pinch. Wow that's more stuff to remember than when I step up to drive a golf ball (hopefully) down the fairway. Richard it has been the most amazing summer of my life. Being a realist, I worry about the law of averages whacking me right back to level the field. Jim, where there's a will there's a way. Ken, good point about the water. I'm planning to explore the ins and outs of this whole retirement thing too. Ahhh... the mysteries of golf. If there's one thing I have no competence with, or desire to explore the depths of my incompetence in relation to, it's golf. I have no end of admiration for your ability to smash that tiny white orb down a fairway in approximately the right direction. The times I've tried, I've been a danger to everyone on the course. Very comprehensive, David, and no "woman questions/answers game" please, fashion, hairdo and painted fingernails are not my strong suit. Nice review of a great summer, David. It pleases me to hear that your best summer ever was heavily related to scooter riding. It is the same for me. Those little machines become quite important after a while. My only regret of the summer is not getting to New England and Montreal to visit you and see the sights. The woes of being a working scooter enthusiast. Ah Sonja, I was thinking asking about loves, family, homes, recipes... girl talk. Taking snapshots of the instruments and pumps... very effective and efficient, not to mention the time stamps, and these days, location tags as well. What a great way to crack that nut! Bill you have a standing invitation, except that it might end up being Toronto instead of Montreal, 'God willing, the creek don't rise' as my brother in law is sometimes fond of saying. I really want to meet Ken Wilson and Bill Leuthold, hopefully in the company of Jim Mandle. 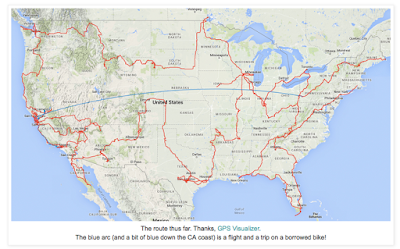 That means an epic 2016 ride in Florida ideally with a leg that stretches down to Key West. Oh well if you must. Mind you, you have got scooter touring figured out now. Should be a piece of cake. Bring Steve Williams. Thanks for the kind words Shel, and thanks for dropping by. Michael, it may take some time, but it will happen. Nothing would please me more than having Steve Williams along. Nothing would please me more at the moment either. At the moment I'm wrestling with a back issue that wants to end my riding career. Well, well, well... where's there's a will, there's surely a way.